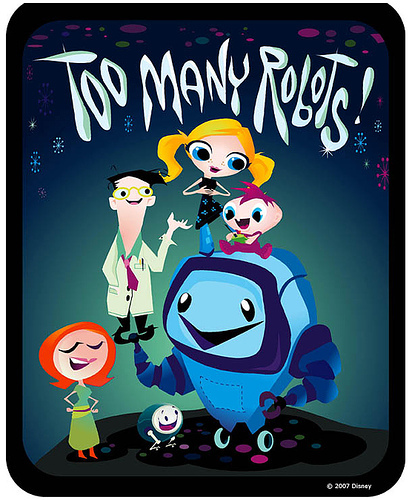 Attaboy’s first animated short “Too Many Robots!” premiers on Disney Channel this Friday, April 20th at 7:55pm. It’s the 9th episode of the new Disney series Shorty McShorts’ Shorts. After it airs, it should be available for download on iTunes. See Attaboy’s announcement for more info. “Too Many Robots!” was created and directed by Attaboy and written by Johanna Stein. The animation was done by Ghostbot, with music by Mike Relm. The short features voices by Kelly Stables (The Ring 2 & 3), Iris Bahr (Larry the Cable Guy), Brian Stepanek (The Suite Life of Zack and Cody) and Greg Cipes (Teen Titans). Attaboy has been working on this for two years and it’s great to see if finally scheduled for broadcast. I’m really looking forward to seeing it. UPDATE 1: You can now watch Too Many Robots! on the Disney website. UPDATE 2: It’s up on YouTube now as well.